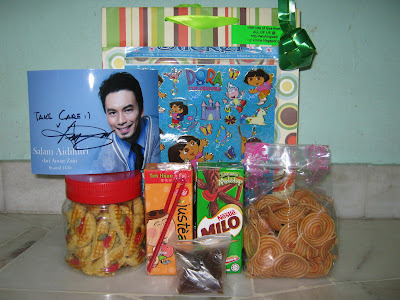 Syukur Alhamdulillah, the Syawal Note care packages were handed to the patients today. 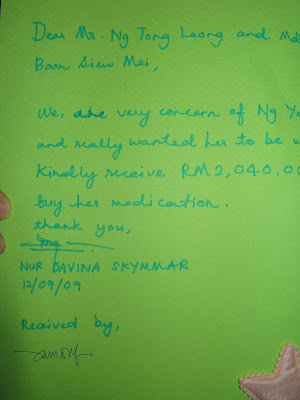 The recipients are the patients of UMMC and UKM Medical Centre. For those who are not warded, we have handed it to the nurses to keep it first, and pass it to the children when they go to the ward. Believe me.. there were smiles everywhere. Cards & care pack were handed to the children personally by me and no words can express how I felt. This Syawal Note project combined the love of people from various background. Love for the children put us together. A priceless gift that Allah gave to all of us.Alhamdulillah.. Thank you Allah for allowing it to be a success.. and Thank you to all of YOU who have been a part of it..
AS I AM HOLDING BIG AMOUNT OF MONEY NOW, PLEASE CONTACT ME DIRECTLY BEFORE TRANSFERRING. I AM OVERWHELMED BY THE RESPONSE AS ALL I DO IS POST ABOUT IT. FROM NOW, I WILL HAND OVER TO THE HOSPITAL. THANK YOU SO MUCH AND MAY ALLAH BLESS YOU. This is a VERY URGENT call that I would appreciate if you could share this note with your friends. The description above is actually copied from Doctor's letter. Basically she needs help to get the supply of medication. 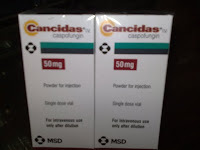 With an adequate anti-fungal treatment, most patients will recover and can continue with their chemotherapy. Her dad is working as technician, and her mom had to stop work to take care of her. They had spend more than RM20k for the past 2 months. Now, they cannot afford to pay for the medication. We are trying our best to get help from various people/organization. Now, as I am composing this note, this girl has medicine for 5 days ( treatment with this expensive medication started 10th Sept 09 ).By Tuesday, there is still no allocation for the medication. She needs another 25 days of supply. A big fan of Naruto, she smiles a lot, but hardly talk. But, there was a day, she looked at me and said " Terima kasih kakak"
Those who would like to help, please contact me and I will direct you to the doctor in charge. A friend called me yesterday. Haven't heard from him for quite sometime, glad to hear that his family is doing fine, Alhamdulillah. He asked me .. " how did u do it..asking people for donation.." His question brought a smile to me.. Honestly, there are many loving and caring people out there, still. Syukur Alhamdulillah. Yesterday,another added to my list. It is Gapurna Group. Allah moved their heart to contact me.. Subhanallah. What else could I say , except... as usual, drops of tears. I confessed before, I hardly cry when I am with the children. But I do shed tears of joy. I did yesterday. Love, tender and care still exist, no matter how tough and rough the world is nowadays. I believe in that. Strongly.
" Dengarlah Sayang " is a project/programme that popped in my head while running on the thread mill. Funny but true, most of the ideas came either while at the gym or at the tennis court ;) However, I had to put it on hold because... this crossed my mind when the H1N1 became a pandemic. However.. what's wrong in planning and hoping that this would be a reality, right? Here goes what "Dengarlah Sayang" is all about..
"Dengarlah Sayang" is a programme of story telling sessions for the children at the oncology ward. This story telling session will be a fun and enjoyable moment. Nothing wrong in giving the children a moment of fantasy. For those who would like to be the story tellers, you are gorgeous :) Drop me a note yea..
A little bit update of Syawal Note & Cinderella Day Out. All praise to the Almighty, things are on track. 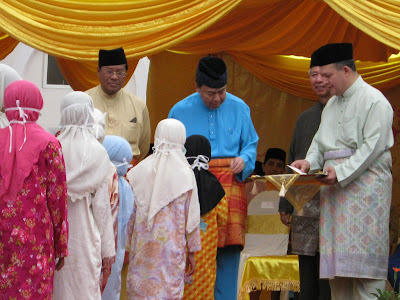 The delivery date for the Syawal Note will be on 12th September 2009 and Cinderella Day Out will be on 13th September, InsyaAllah. Everyday, Wishing Well Programme is being blessed with wonderful surprises. Various people of different background comes forward, extending a helping hand in making each programme a reality, Subhanallah. To me, every individual is unique in their own way. Regardless who you are, believe me.. when the little heroes smile... YOU ARE A PART OF IT, INSYAALLAH. Personally... regardless of what you do for a living.. clerks, students, engineers, architects, home makers, singers, artist, professionals, sportsmen, politicians, doctors, nurses, teachers, bankers, or any career that are in this world ( sorry.. to type all, it will be endless )... that does not matter to me.What matter most is your HEART. Thank you Allah, for crossing my path with all these wonderful people.. Thank you to YOU, for believing in what I do..
May Allah bless you, always..
Semalam saya menelefon ibu Adik Hazim, untuk bertanyakan keadaan mereka sekeluarga. Hmm.. guess what, sekarang ibunya dah jadi bisnes minded :) Syukur alhamdulillah.. satu yang dapat saya lihat perubahan keluarga ini, mereka semakin positif dalam mengharungi hidup sehari hari. Ibu Hazim sekarang tengah cuba nak menjual kuih siput. Selain dari itu, selepas mereka mendapat sumbangan peti ais, sebelum Ramadhan , mereka sudah mula menjual ais krim malaysia ( yang dalam plastik panjang ). Untuk mereka yang sentiasa mendoakan keluarga ini, saya dengan rasa rendah diri memberitahu, alhamdulillah.. keadaan mereka semakin ok dari segi rohani. Kepincangan kewangan masih wujud dan kesihatan Adik Hazim masih di tahap yang agak kritikal. Namun, saya dapat rasakan keyakinan diri terutama pada ibu Adik Hazim dan juga Adik Hazim sendiri semakin baik. Adik Hazim adalah antara satu dalam beribu ribu malah berjuta juta kanak-kanak yang memerlukan perhatian kita. Projek saya dan rakan-rakan semakin mendapat perhatian ramai pihak. Oleh itu, saya dengan rasa rendah diri memohon, sekiranya ada di antara anda di luar sana mengetahui pihak, iaitu kanak-kanak yang perlu dibantu, harap dapat hubungi saya. Tiada janji dari pihak kami, tapi.. kami berdoa agar Allah mempermudahkan usaha kami dalam menggembirakan hati mereka yang memerlukan.. insyaAllah..
As we are in our 13th day of Ramadhan, I have just kicked off the Cinderella Day Out. 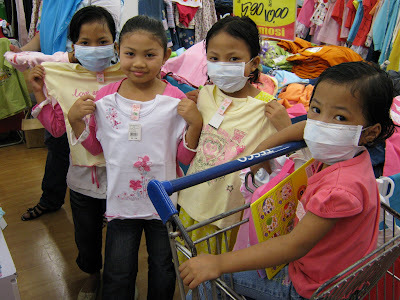 It is a simple Programme.. to bring the 4 children of a breast cancer ( stage 4 ) patient to buy new clothes for the Eid. For little kids, to get a new pair of clothes for the Eid is like a princess going to a ball ( hey.. adults too right ? ;) ) Anyway.. the plan is to get a new pair of baju kurung each. I remain with my principle that, no matter how difficult things are, children have the right to be happy, to enjoy their childhood and we, the adults can help to improve things, of course..with Allah's permission definitely. The mother continues with her treatment at HKL. Her story is one of the many story that we might have seen on Oprah shows.. of a mother trying her best to raise her daughters. She wanted to work, but her cancer becomes aggressive everyday. 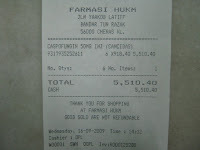 All praise to the Almighty, I received a total of RM650 to but baju kurung & new shoes for the 4 little girls.